MIPS has been one of the largest and most professional exhibition of security and safety products that attracted more than 600 suppliers from 46 countries and regions. All enterprises were eager to share their newest and advanced achievements of security solutions to the world. 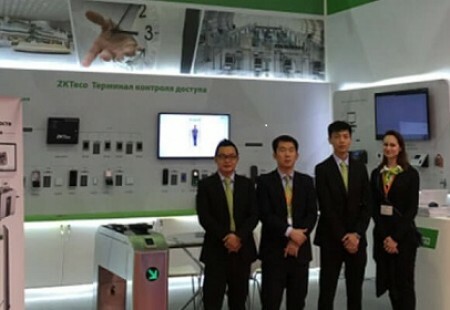 As one of the most important and sparkiest stars, ZKTeco Russia delivered the phenomenon Biometric security show in Moscow during 21st to 24th March. ZKTeco always aims to provide the best products, we have developed a brand new exclusive product line — Green label. It adopts ZKTeco revolutionary SilkID fingerprint sensor which provides a good performance towards dry, wet and rough finger and alive fingerprint detection. It was totally fascinating and surprising to visitors and other biometric providers. In order to meet different project requirements of hardware, function and software compatibility, ZKBioSecurity3.0 not only contains 4 key featured modules: access control, video linkage, elevator control and visitor management, but also is compatible with third party camera perfectly. With rapid development of SEM, their requirements are also important for us, so we have developed another professional solution. Meanwhile, we showed the latest biometric technologies including palm verification and portable time management solutions during the exhibition. Another highlight is our biometric entrance terminal, with integrated biometric technology, we led the entrance field to the higher security level and provide a variety of entrance terminal solution for different project applications. During 4 days of exhibition, hundreds of thousands of people not only visited our booth and experienced our whole product lines and solution happily, but also gave a lot of credits to biometric products made by ZKTeco. ZKTeco Russia aims to share the professional all-in-one biometric solution with all of people, and MIPS as the most well-known security exhibition in Russia, so we will take full advantage of this platform and seek all possible ways to serve our customers and present to new biometric technologies to make a better and safer world for all of us.